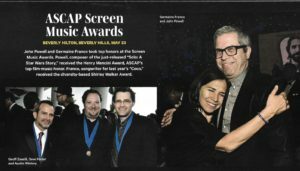 Composers John Powell and Germaine Franco took top honors at this week’s ASCAP Screen Music Awards. 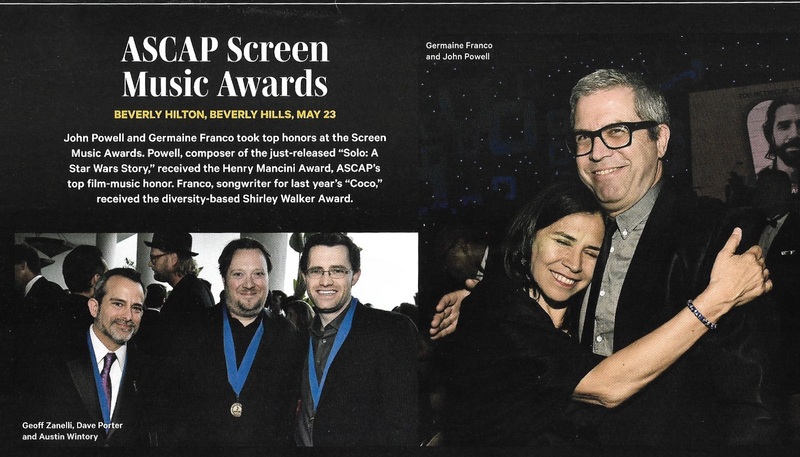 Powell won the Henry Mancini award for lifetime achievement as a film composer (for such scores as How to Train Your Dragon, The Bourne Identity and Solo: A Star Wars Story), while Franco (songwriter for Coco, currently scoring TV’s Vida) received the Shirley Walker award for contributing to “the diversity of film and television music.” Other honorees included Gordy Haab and Dave Porter; a full rundown of the evening is in my Variety story here. This entry was posted in Composers, Film Music, Interviews, Television Music and tagged ASCAP, ASCAP Screen Awards, Dave Porter, Germaine Franco, Gordy Haab, Henry Mancini Award, John Powell, Shirley Walker Award, Variety on May 24, 2018 by Jon Burlingame.